Those of your who know us know that we have been working on this project for five years or so, packing in writing time between nearly year-round trips and climbs. Holing up for weeks in our little tin shack in Bishop (and then a few more weeks on the Zone Diet to work off the results of too much computer time and too little exercise), spending long afternoons huddled in our little rental car in New Zealand during rainy spells between climbs, running down the car battery by alternately running two laptops off the cigarette lighter....it's been a long haul! But finally, it's out. 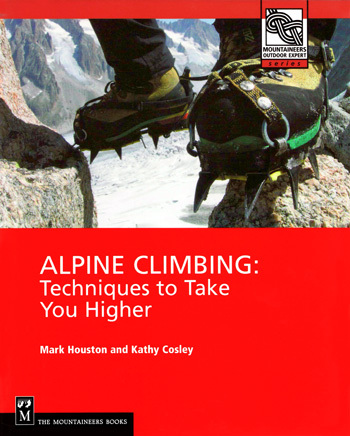 Alpine Climbing: Techniques to Take You Higher is intended for rock climbers, hikers or others interested in learning to access technical alpine terrain, and those who want to do a better job at making the gazillions of decisions necessary every day in the mountains. It is published by The Mountaineers Books and is part of their "Outdoor Expert" series. Who's feet are those, anyway? If you like it, they tell us that it spurs sales to have glowing critiques posted on amazon.com, so log on and exaggerate! If you don't like it, well, what can we say? Actually, if there is ever a rewrite or second edition (terror grips me as I write this!) it would help us to know what to change. Let us have it.